Oriana Fallaci died Friday, September 15, in Florence, Italy. She and I had been in contact for four years, ever since she first wrote me in October 2002. In her memory, I offer an introduction to Ms Fallaci that I delivered, at her request, on November 28, 2005, at a Center for the Study of Popular Culture event honoring her, chaired by David Horowitz. Her talk that evening, at the 3 West Club in New York City, was latterly incorporated in her book, The Force of Reason. I believe this was her final public appearance. 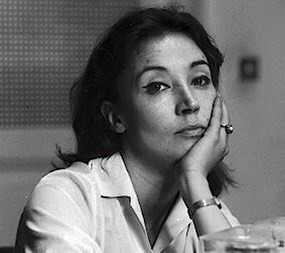 It is my great pleasure to introduce Oriana Fallaci to you. I sat at the typewriter for the first time and fell in love with the words that emerged like drops, one by one, and remained on the white sheet of paper ... every drop became something that if spoken would have flown away, but on the sheets as words, became solidified, whether they were good or bad. In a less poetic vein, she has also acknowledged that "What really pushes me to write is my obsession with death." Ms Fallaci subsequently wrote for many Italian, European, and American publications, including Corriere della Sera, Le Nouvel Observateur, Der Stern, Life, Look, New York Times Magazine, Washington Post, and The New Republic. As a war correspondent, she covered the major conflicts of our time. She covered the insurrection in Hungary, getting arrested in the process. She spent seven years in the field in Vietnam, both North and South, and ended up being thrown out of the South. She covered the Lebanon civil war and the Kuwait War. Ms Fallaci conducted her trademark confrontational interviews with powerful figures, or to use her more colorful terminology, "those bastards who decide our lives," including Willy Brandt, Lech Walesa, Muammar Qaddafi, Golda Meir, Ariel Sharon, Haile Selassie, the Shah of Iran, Indira Gandhi, Zulfikar Ali Bhutto, and Deng Xiaoping, and H. Rap Brown. Also, she interviewed leading non-political figures such as Federico Fellini, Sean Connery, Sammy Davis, Jr., Arthur Miller, Orson Welles and even Hugh Hefner. She is the only person to have interviewed the Ayatollah Khomeini, with whom she spent six hours. At one point, she memorably ripped off her chador in indignation and heaved it at his eminence. Known for her challenging interviewing tactics, Fallaci goaded her subjects into making unintended revelations. "Let's talk about war," she challenged Henry Kissinger in their 1972 interview, perhaps the one Americans remember best. Prior to this interview, Kissinger had revealed little to the press about his life and personality. 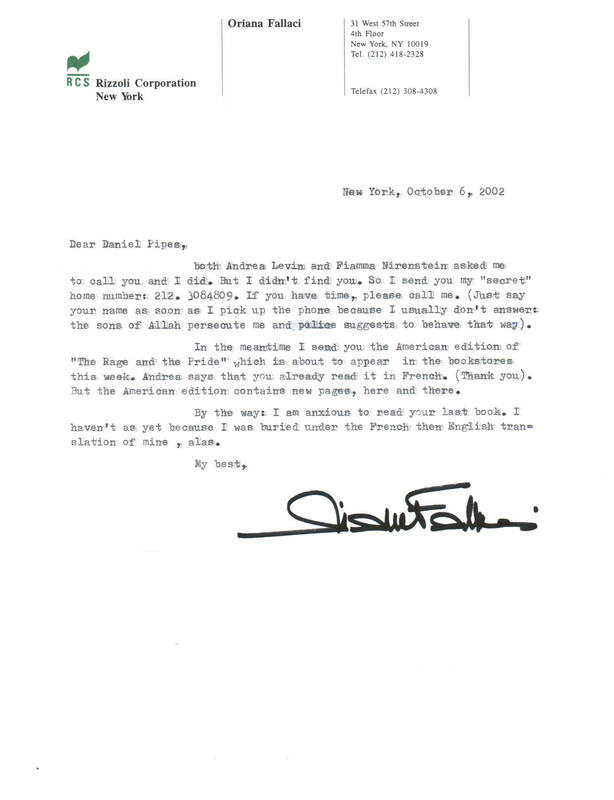 Fallaci kept after the secretary of state during their conversation to explain why a mere diplomat enjoyed such fame. He dodged the question, but eventually gave in. "Sometimes," he said, "I see myself as a cowboy leading the caravan alone astride his horse, a wild West tale if you like." Kissinger thus revealed how he saw himself - as a heroic, imposing leader who controlled the direction of U.S. politics – and, consequently, was massively criticized. Even years later, Kissinger referred to his interview with Ms Fallaci as "the most disastrous conversation I ever had with any member of the press." Her interviews also included unusual details. For example, she wrote of Yasir Arafat about his "thick, Arab mustache and his short height which, combined with small hands and feet, fat legs, a massive trunk, huge hips, and a swollen belly, made him appear rather odd." She described his head and face in great detail, noting that "he has almost no cheeks or forehead, everything is summed up in a large mouth with red and fleshy lips, an aggressive nose, and two eyes that hypnotize you." One biographer, Jill M. Duquaine, calls Fallaci the "greatest political interviewer of modern times"
She is the author of 13 books, all but two of them translated into English. In all, they have been translated into 26 languages and published in 31 countries. The first one, The Seven Sins of Hollywood, came out in Italian in 1958, featuring a preface by Orson Welles. The Egotists: Sixteen Surprising Interviews, 1968. An Interview with History, 1976, collected some of her outstanding interviews; it has been described as "one of the classics of modern journalism." Letter to a Child Never Born, 1976 (a novel, called "one of the finest feminist writings about pregnancy, abortion, and emotional torture"). Inshallah, 1992 (another novel, about the civil war in Lebanon). After a silence of ten years, she published The Rage and the Pride in 2001, a response to the challenge of radical Islam. It sold 1 million copies in Italy and 500,000 in the rest of Europe. In 2004, she wrote The Force of Reason, out this month in English from Rizzoli. It also sold 1 million copies in Italy. In it, she argues that the fall of the West has commenced due to radical Islam. Western-style democracy, with its liberty, human rights, freedom of thought and religion, cannot coexist with radical Islam. One of them has to perish. She puts her money on the West failing. The third book of her Islamic trilogy, Fallaci Interviews Herself and The Apocalypse, also came out in 2004, in Italian (and not yet in English). Here is what Bat Ye'or had to say of it, writing at FrontPageMag.com, another activity of this evening's sponsor, the Center for the Study of Popular Culture: "In this brief masterpiece Oriana Fallaci moves us to tears, shakes us with laughter, enlightens us and transmits her love and despair for a Europe she served with such great devotion and now watches in despair as it goes adrift." In an interview in 2002, she was asked about George W. Bush. "We will see; it's too soon," she replied. "I have the impression that Bush has a certain vigor and also a dignity which had been forgotten in the United States for eight years." But she has her differences with him, especially when the president calls Islam a "religion of peace." "Do you know what I do each time he says it on TV? I'm there alone, and I watch it and say, 'Shut up! Shut up, Bush!' But he doesn't listen to me." In earlier years, her reportage put in her many times in harm's way; nowadays, it is her direct and unflinching writings on Islam that create dangers for her: "My life," Ms Fallaci wrote recently, "is seriously in danger." She also has legal headaches. She was on trial twice in France in 2002 and was brought up on charges in Italy in May 2005. She was indicted under a provision of the Italian penal code that criminalizes the "vilification of any religion admitted by the state." Specifically, it states that The Force of Reason "defames Islam." One might therefore say that, wanted for a speech crime in her native country, Europe's most celebrated journalist now lives in exile in Manhattan. The plaintiff is an extremist Muslim of Scottish origin named Adel Smith. He is thought to be the author of a pamphlet titled "Islam Punishes Oriana Fallaci" that calls upon Muslims to "eliminate" her and to "go and die with Fallaci." Bye the bye, Smith has also called for the destruction of the medieval fresco, "The Last Judgment" by Giovanni da Modena, in Bologna Cathedral, because it depicts the Prophet Muhammad as languishing in hell. I feel less alone when I read the books of Ratzinger I am an atheist, and if an atheist and a pope think the same things, there must be something true. It's that simple! There must be some human truth here that is beyond religion. I start working early in the morning (eight or eight-thirty a.m.) and go on until six p.m. or seven p.m. without interruption. That is, without eating and without resting. I smoke more than usual, which means, around fifty cigarettes a day. I sleep badly in the night. I don't see anybody. I don't answer the telephone. I don't go anywhere. I ignore the Sundays, the holidays, the Christmases, the New Year's Eves. I get hysterical, in other words, and unhappy and unsatisfied and guilty if I don't produce much. By the way, I am a very slow writer. And I rewrite obsessively. to die a little less when I die. To leave the children I did not have... . To make people think a little more, outside the dogmas that this society has nourished us with through centuries. To give stories and ideas that help people to see better, to think better, to know a little more. Ladies and gentlemen, please join me in welcoming Oriana Fallaci who will speak on "The European Apocalypse: Islam and the West." Sep. 18, 2006 update: I reviewed Rage and Pride when it appeared in French in the Middle East Quarterly. Apr. 16, 2011 update: I focus on one particular Fallaci interview at "Qaddafi's Empty Boast."